Our dedicated team consists of Therapy Dogs, Service Dogs, and Handlers. Both canine and trainer work hard to earn each of their certifications so that they can give their best service to the community. 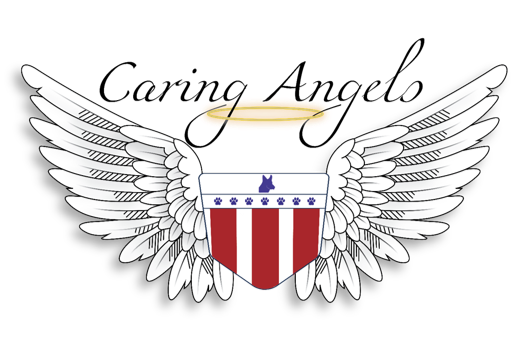 K-9 Caring Angels mission is to provide service, therapy, and comfort to the community through our well trained and rigorously tested Service, Therapy, and Comfort Canines. K-9 Caring Angels consists of three pillars designating the roles that our dogs play in the community. Caring Angel is the designation of our Therapy Dogs. Therapy Dogs are not Service Dogs. Our Caring Angels Therapy Dogs consist of trained, tested and certified dogs and handlers that volunteer to give back to the community providing comfort and love where needed to improve the lives of others. Examples include childrens programs, assisted living, people with disabilities, school programs, hospice, veterans, soldiers, first responders and more. Our Warrior's Angels designation identifies the Service Dog program within K-9 Caring Angels. We chose the word "Warrior" in part because our first dogs were designated for veterans and because a warrior fights the good fight and is valiant in the face of hardship. While warriors can stand alone, they are stronger with their brothers and sisters beside them. In this spirit, much like a guardian angel, our Warrior's Angels stand by their handlers offering unwavering support and loyalty. With one of our Warrior's Angels by their side our veterans can move forward toward peace, joy, confidence and serenity well earned and deserved for their selfless service. It is important to note that fighters aren't only defined by our soldiers and veterans. We also honor children with special needs and victims of trauma to guide them back to joy, confidence and a life deserved. Completed more than 200 hours of loyal and faithful Service. Show control and focus off leash in any situation. They train together to the point that both are experts at thier work. The handler with thier Canine have created a unique or specialized program for an organization in need. 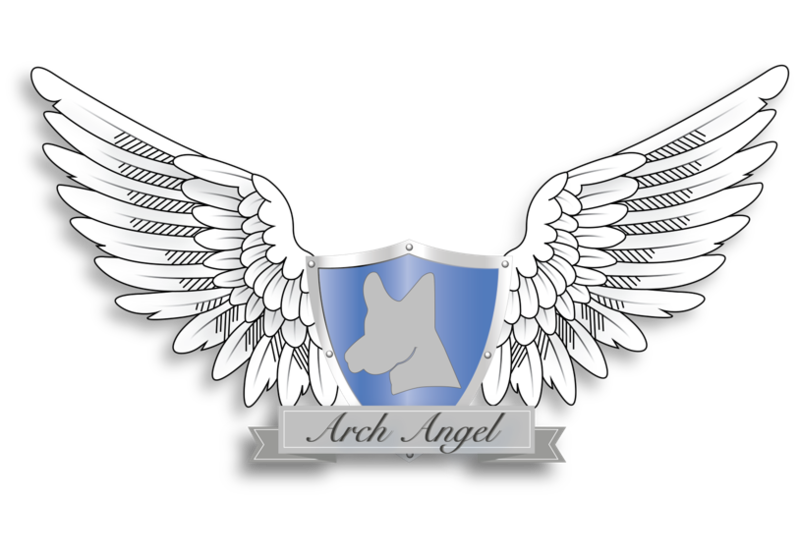 Arch Angel really recognizes those handlers and canines that have gone above and beyond and show a strong and sustained commitment to each other and their community. At K-9 Caring Angels, we work to provide service to our community through many channels. 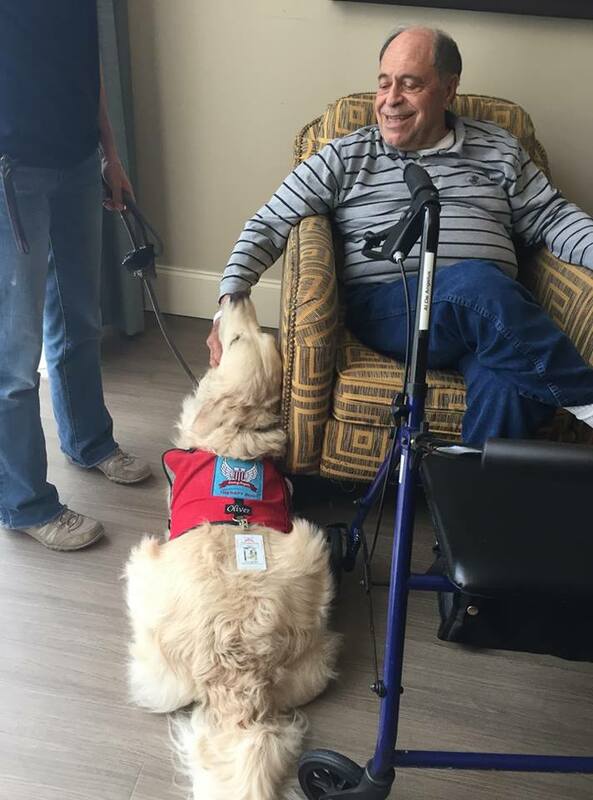 From our team of therapy dogs and handlers that attend events at assisted living to children's organizations, honor flights and more, to our donated Warrior's Angels Psychiatric Service dogs we work to Serve our community. 1st to train and donate a full time, in firehouse therapy dog through a pilot program developed in conjunction with Fairfax County Fire and Rescue. Started in 2012 by 2013 we had a team of only 20 Caring Angels, today over 200 in 14 locations around the nation. With 14 locations and growing we are spreading our service which started in Northern Virginia to locations in MD, OH, MI, NY, RI, CO, NV, TX and CA. K-9 Caring Angels are always on the lookout for new opportunities to give back and have a positive impact on the community, organizations, families and individuals. If you have a suggestion we are always open to new ideas! You can make a difference. If you have a dog that has the right stuff; contact us and arrange for an evaluation to discuss your dog’s potential for joining our team! We hold training and certification opportunities are available throughout the year depending on demand. Our k-9 Caring Angels leadership, volunteers and handlers are vigilant in their search for areas in the community that could use our help and we encourage individuals to seek out organizations or individuals that can benefit from our dogs. From assisted living, to children’s programs, honor flights, first-responders, veterans, soldiers and more our volunteers and leadership want to give back. These are our Warrior Angels and they are generally purchased by or donated to k-9 Caring Angels and are trained as psychiatric service dogs to be donated to those in need. Occasionally individuals or families come to us looking for training of a dog they have already acquired and we will evaluate their suitability. Through an application process, pilot programs and or individual inquiries we consider carefully the individual, organization, needs and future sustainability of the program or relationship. Please inquire directly with us about our donation process and program. This is program through which we work with organizations to determine needs and program and train a therapy or service dog to live at the facility full time to provide comfort and or assist individuals, etc. An example would be the fire house dogs we trained and donated in partnership with Fairfax County Fire and Rescue. DD, short for DD-214, has brought balance to not only Green, but his whole family. She is with him 24/7; taking walks with him during restless nights and accompanying him to work at Northrup Grumman. She makes a big impact not just on Green, but on everyone she and he come in contact with. There are many ways to get involved with K-9 Caring Angels and all assistance is appreciated. From becoming a K-9 Caring Angel Therapy Team with your dog to volunteering time with our organization or in the community or making an important financial donation to assist us in continuing to provide service dogs to the community and ultimately to launch a new training and housing facility to maximize our impact and ability to serve. Is your dog up to snuff to pass our challenging Therapy Dog Test? Does your canine need a little work to sharpen skills or are you starting with a clean slate. Good training is important to success as a Therapy Dog. As volunteers for fostering, working on events, etc are available they will be announced ahead of time.